French pianist Alexandre Tharaud will step in on short notice for Piotr Anderszewski on the Oberlin Artist Recital Series this Wednesday evening, April 3 at 7:30 pm in Finney Chapel. Anderszewski has withdrawn from his current recital tour due to illness. Tickets for the cancelled recital will be honored at the door, and new ticket buyers can reserve online here. On Wednesday, Tharaud will play J.S. Bach’s so-called Goldberg Variations, followed by a question and answer session moderated by Oberlin piano professor Robert Shannon. The popular title of the work refers to the tale — now regarded as spurious — of a harpsichordist named Goldberg who is supposed to have appealed to Bach for a work to entertain his insomniac patron during sleepless nights. One of the only Bach works printed during his lifetime, the 1741 copper plate engraving by Nuremberg publisher Balthasar Schmid is titled “Keyboard Exercise, consisting of an ARIA with diverse variations for harpsichord with two manuals.” The bass line of the aria, a lovely little Sarabande that Anna Maria Magdalena Bach entered in her notebook around 1740, provided Bach with the basis for thirty variations of extraordinary variety, ending with a Quodlibet or humorous mashup of two German folk songs. “It’s been so long since I’ve seen you” and “Cabbage and turnips have driven me away” herald the reprise of the original Sarabande. Eleven of the variations are specified to be played on two manuals, presenting a challenge for pianists who set out to play them on a single keyboard. In 2016, Tharaud recorded the Goldberg Variations on the ECHO Klassik label. Watch a brief promotional video here. Tharaud is at home in a vast swath of repertoire ranging from the Baroque to the newly-composed. Cleveland and Oberlin audiences heard him last September in the U.S. premiere of Hans Abrahamsen’s Left, alone for piano left hand and orchestra with Franz Welser-Möst and The Cleveland Orchestra both at Severance Hall and in Finney Chapel. His most recent recording, released last fall, comprises the last three of Beethoven’s piano sonatas. 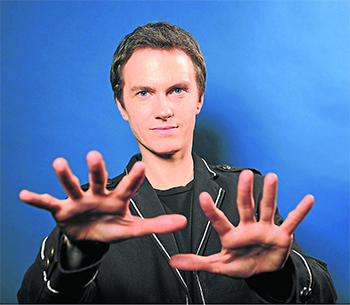 A writer as well as a performer, Alexandre Tharaud has two books to his credit: Piano intime: conversations avec Nicolas Southon (Philippe Rey, 2013), and Montrez-moi vos mains (“Show me your hands,” Grasset, 2017). He has played himself in Michael Haneke’s 2012 film, Amour. Tharaud in Hans Abrahamsen’s Left Alone with Franz Welser-Möst in Severance Hall, September 2018. Photo by Roger Mastroianni. After his recital in Oberlin on Wednesday, Tharaud will play back-to-back performances of the Goldberg Variations in Fort Worth on Thursday and Friday, then return to Montréal to solo with the Orchestre Symphonique in Mozart’s 21st Concerto later in April. 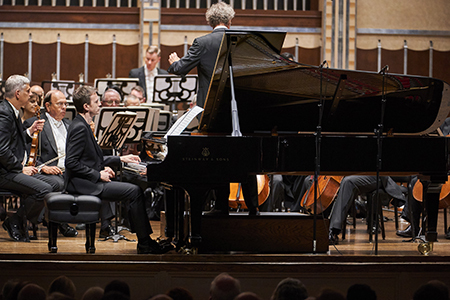 The pianist recalled his earlier appearance with The Cleveland Orchestra in Finney Chapel. “I remember that the acoustics are very good, and I also remember that it was very hot onstage and it was difficult to play. But I only had to perform for 25 minutes. The Orchestra was very professional. They didn’t say anything about the heat and they played the entire concert.” I joked that at least he only had to play with his left hand, and Tharaud suggested that he might have used his right hand to hold a fan. Published on ClevelandClassical.com April 1, 2019. Revised on April 2 to incorporate a conversation with Alexandre Tharaud.